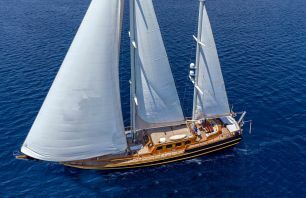 Turkish built Gulets for sale are traditionally designed for commercial and private cruising in the eastern mediterranean waters and mostly rigged as two masted schooner or ketch or yawl . 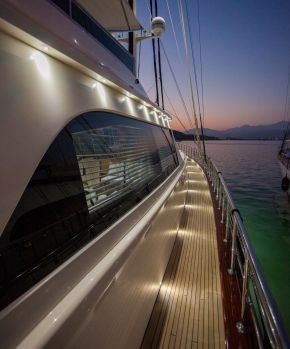 Modern Gulet hull is epoxy laminated Mahogany or hard wood with twin screw motor sailing yachts mostly built in Istanbul and southwestern Turkish riviera. Although similar vessels can be found all around the eastern mediterranean. 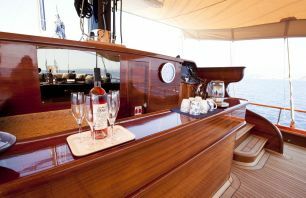 Gulets for sale has different sizes from 14 to 42 metres and are very popular for commercial yacht charter. Gulets for sale in Turkey has a standard construction methods which has been practiced in Aegean and eastern mediterranean Turkish boatyards such as Antalya, Manavgat, Fethiye, Marmaris, Bozburun and Bodrum where Gulets for sale are built in traditional methods. Turkish Gulet for sale building commences with the construction of a steel box called iron spine filled with metal scraps and concrete , the traditional long keel is to keep the lover and the upper keel intact and to keep the GM point as low as possible to avoid heeling and to make them stable. in addition construction of the frames and stiffners of the hull assembled with high quality materials such as two component epoxy resins , high tech materials to make sure the hull is monobloc , strong and seaworthy . Turkish gulet for sale are always built with solid construction materials such as african mahogany for her strength and flexibility to gain seaworthiness, the side plankings are three or four layers of epoxy laminated 10 mm mahogany strips coated with two layers of fiber glass and finally covered with two components epoxy steel putty . Our portfolio of Turkish gulets for sale has many alternatives and you will definitely find what you are looking for. 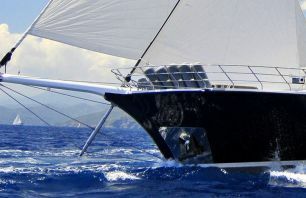 Hundreds of gulet for sale are in our portfolio either preowned or newly built custom design, custom built ones.